Deli Moroccan has been in business on Bussorah Street for more than 9 years, catering to diners who enjoy kebabs. However, a few months ago, the owners opened another branch on the same street, but located closer to Masjid Sultan, selling lighter bites such as sandwiches and wraps. 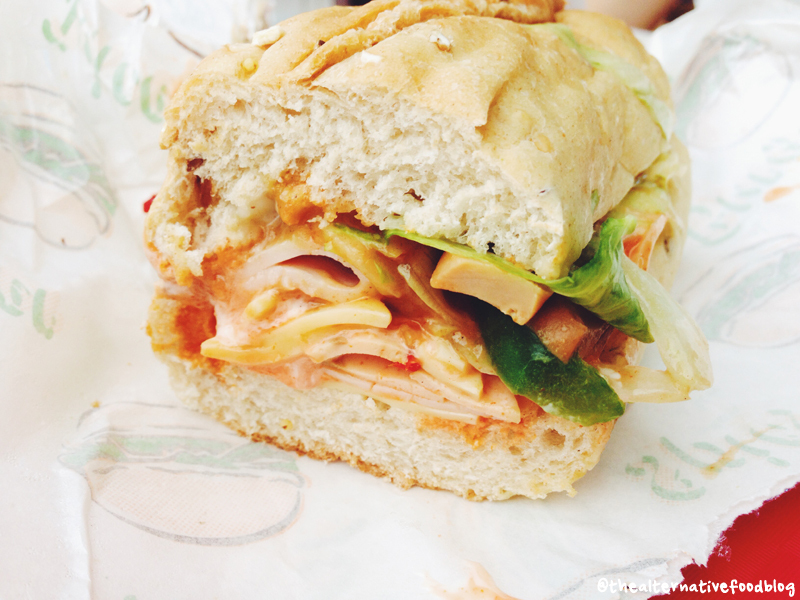 Having been to Deli Moroccan once before, Shereen was impressed with their sandwiches and upon learning that they offered vegetarian options on their menu, she suggested we do a proper review of this relatively new sandwich joint in the Kampong Glam area. As with a lot of Moroccan eateries, Deli Moroccan is dimly lit with orange lights that create a somewhat romantic and slightly mysterious feel to the place. It is not very big seating about 20 people comfortably indoors. They had about three booths for four-seaters and some loose tables which we suspect could be moved around to fit your group size. On top of this, they also have outdoor seating for larger groups of people or those who prefer the fresh air and sunlight. We were greeted promptly by the owner himself when we entered the restaurant, and he immediately ushered us to his favourite seat outdoors. He also chatted with us briefly, bringing the service to a more personal level. A quick glance at the menu will confirm that Deli Moroccan does indeed cater to vegetarians with items such as egg sandwiches and an assortment of falafel wraps. Each sandwich or wrap set comes complete with a lime or orange juice so you don’t have to add on an additional drink order unless you prefer other soft drinks. Shereen decided to order a Mixed Sandwich (SGD $8.50) while I ordered a Mexican Falafel Wrap (SGD $8.50). We also ordered a Vegetarian Moroccan Pizza (SGD $20.00) to share after being persuaded by the boss himself. Their sandwiches are prepared ala Subway style. While you don’t get to choose the bread, you get to decide what vegetables you want, what sauces you prefer and of course, what fillings you would like. The Mixed Sandwich consists of different types of deli meats, fresh lettuce and tomatoes, along with a “secret sauce” created by the boss, sandwiched in a half-sliced loaf of bread. A quick chat with the owners reveal that the bread used in their sandwiches is baked with their own recipe even though it is supplied by another F&B kitchen. Since Shereen had just dined here the weekend before our visit, she already knew what to expect from her sandwich and was excited to devour her dish. However, when her dish arrived, she was a little disappointed because it tasted quite different from what she had ordered the last time. On Shereen’s first visit there, her sandwich was made by the boss’ wife, Lina while this time round, it was made by the boss himself. According to Shereen, this time around, the sauce was sour and too spicy for her, and was very different from the sweet chili and mayonnaise dressing she tasted in her previous trip to the restaurant. In addition, Shereen’s Mixed Sandwich was not exactly the same as what was pictured in the menu. While the picture showed that there were an assortment of chicken and turkey ham, and beef pepperoni, the deli fillings in Shereen’s Mixed Sandwich appears to be chicken and turkey ham only. Shereen checked with the service staff who confirmed that there was no beef in the sandwich. Shereen was rather disappointed as the sandwich what was not what was promised on the menu. However, a quick clarification with Lina revealed that the diners are allowed to specify and choose the fillings they prefer in their Mixed Sandwich. Shereen did share with Lina and me that her sandwich tasted very different on both occasions – one definitely spicier than the other. Lina was quick to share that perhaps her style of making the sandwiches was slightly different from her husband’s, thus the disparity. On the whole, Shereen was still pleased with her sandwich though she would have preferred it without the spicy sauce. I ordered the Mexican Falafel Wrap (without cheese) which is made up of falafels, chickpeas, salsa, corn, onions, and lettuce, along with the same “secret sauce”, all wrapped up in a tortilla. Falafel is a signature of Middle Eastern food and it seems fitting that Deli Moroccan has an assortment of Falafel Wraps on the menu. A falafel is a small patty made with chickpeas and/or fava beans, and deep fried till they are crispy and golden brown. The falafels at Deli Moroccan were delicious, they were not overly dry or crumbly and well seasoned. The salsa, and the vegetable mix in my wrap were fresh and added flavour to the wrap. However, the sauce was too salty for my liking, and I had to wash it down with the lime juice that came with the meal. The Vegetarian Moroccan Pizza is not on the menu, but it was recommended to us by the boss. 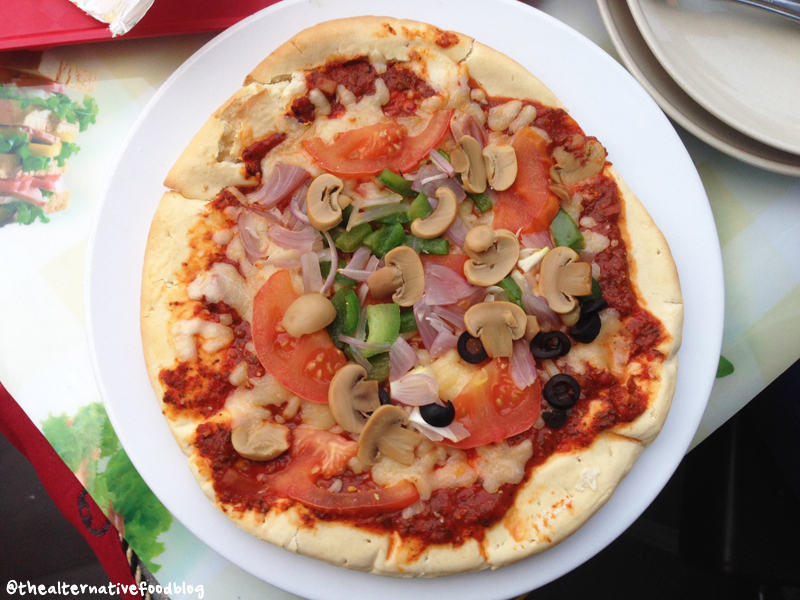 Appearance wise, it looks like any other vegetarian pizza with a topping of tomato sauce, mushrooms, capsicums, and cheese. 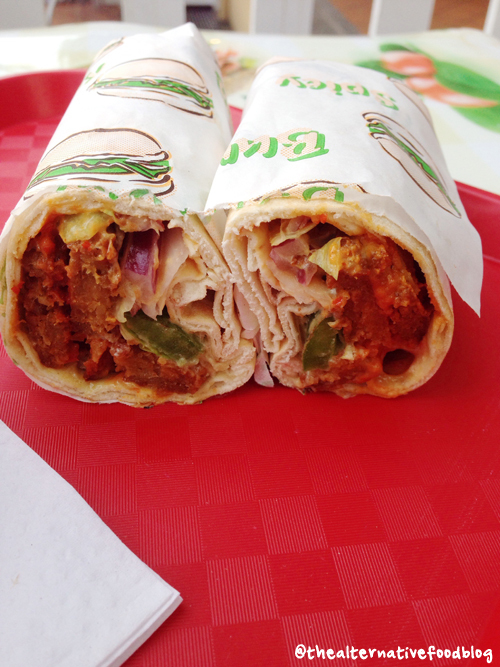 Initially, we were worried that the tomato sauce will be similar to the “secret sauce” used in our sandwich and wrap. Turns out, it tastes less spicy and salty, even with the cheese toppings. However, the pizza has a thicker and more doughy base, tasting more like bread than pizza base. Fans of thin-crusted pizza might not enjoy this pizza as much as the base overshadows the taste of the toppings. Having been used to thin-crusted pizza, and my recent move away from cheese products, I definitely prefer my Mexican Falafel Wrap to the pizza. While we were there, we learnt through a conversation between Lina and a group of diners seated near us that they do not allow the consumption of alcohol ordered from other establishments, even to tourists, because of its proximity to the Masjid. 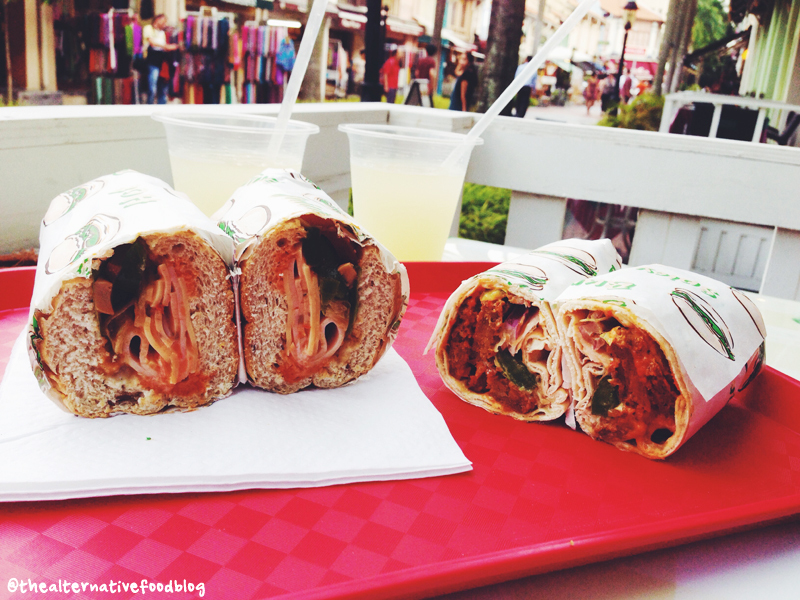 Also, Lina assured us that sandwiches and wraps can be customised to suit any dietary requirements. This definitely is a plus for people like us who need alternative options when it comes to food. On the whole, while we enjoyed the personal touch in the service, we were not overly impressed with the food, especially when the taste of the sandwiches and wraps may differ when prepared by different people. Perhaps, we will visit Deli Moroccan if we happen to be in the vicinity since it offers sandwiches and wraps that cater to both our dietary requirements. Vegetarian Options: Vegetarian options available. Do specify if you don’t take cheese, garlic, and onion. Our Verdict: ♡ ♡ and a half / ♡ ♡ ♡ ♡ ♡ (2 and a half out of 5 hearts).